Passover starts tonight. For the Jewish people all around the world, we remember the harshness of enslavement under the Egyptian Pharohs and celebrate the freedom finally achieved. Many of you probably have seen the classic movie, The Ten Commandments with Charleton Heston. My family watch this every year. Passover is my favorite Jewish holiday because it's all about family and friends gathering, sharing the story of freedom. If you have never participated in a Jewish Seder (the word means order), you are missing out on stories, food, songs, props, and more food as families gather to recount the story of Jews in Egypt and how Moses led the people out of Egypt. My first Seder was with my husband's large yet close family and friends. There were over 20 people gathered around the dining room table. It was a bit intimidating as I only knew about Passover from reading about it. But it was an amazing night full of laughter, great food, and songs. The first time my husband and I hosted our own Seder was when I was pregnant with our first child. It is one thing to attend a Seder, but to host it is definitely a daunting task. Lucky for me, my husband did and still does most of the cooking, which include brisket and matzah ball soup. For our first Seder we invited some of our non-Jewish friends to share the special night. At the Seder, it's not all about eating. Each person takes turn reading the Haggadah which is a special book that tells the story of Passover. There are specific rituals, prayers, food, and 4 cups of wine! Every woman or man who ever hosted will tell you, it's an exhausting night. But I love it. For every Seder we have hosted, we always invited at least one non-Jewish family. Most years, we hosted both nights! One year, we had 20 people the first night and 16 people the second night! Over the years, my husband would let me help cook, not the brisket or the soup, but other main dish items like roasted lamb or chicken. And I love making Passiver deserts! was a woman who lived through the heartache of slavery, but never failed to celebrate the joys of life. She was also a rebel who spoke up when she saw fit. 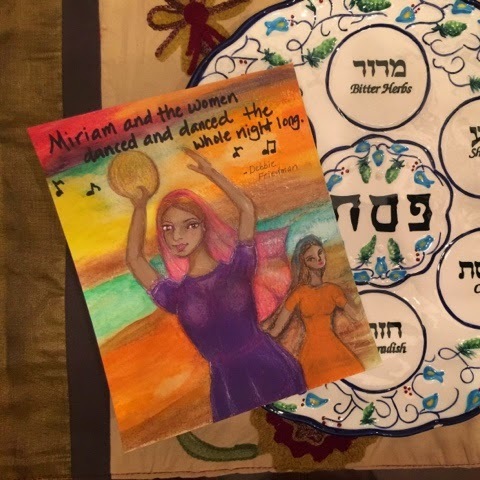 One of my favorite part of the Seder was when all the women got up, held a tambourine and danced as we sang Miriam's Song written by Debbie Friedman. It tells how Miriam and the women grabbed tambourines and began to dance and sing after they crossed the Red Sea. It was a moment of pure joy! Every year, I listen to Friedman's CD The Journey Continues, which was used in the women's Seder. My art today depicts Miriam and the women dancing. I hope I can be as strong as Miriam, as joyous. Happy Passover and Happy Easter! Hi, Angelcake. Just testing the waters :) I hope you and your family have a nice weekend. Yep! Adding that anonymous profile thing may have been a big mistake :D It looks very cheerful over here. Good job, Ms Kari. Nothing fancy here. But I'm so glad you're here. Thank you, Lili! It's going to be a crazy one! Happy to make you laugh, Ms Kari. The line is from a Mary Chapin Carpenter song called The Bug. That, and Shut Up and Kiss Me, are my favorites of her songs. They both make me smile. I love the colors you chose - like a sunset with the addition of purple! Beautiful and joyous! I love the colors too. I'm glad you thought it was joyous, since that was what I was hoping for. Thanks, Mia!